Amazon. eBay. PayPal. Google. Facebook. The Cabinet Office looks at these phenomena and sees a lot of hugely efficient money-making machines with global reach and a high-volume, popular, voluntary and growing take-up. Then the Cabinet Office looks at Whitehall's tax-farming agency, HMRC, and at its big spenders, DWP and the NHS, and it sees ... something different, something sadder, something old-fashioned, halting and with a big hole where the dynamism and the optimism ought to be. Putting to one side the obvious point – in fact forgetting entirely – that providing public services is a categorically different job from retail, the Cabinet Office wants to look modern, it wants to partake in the glory of that spontaneous popularity enjoyed by Amazon et al, and it would no doubt like to experience the same energy and "buzz" as the web Titans. But the Cabinet Office just isn't Google. As soon becomes embarrassingly apparent. Google provides web search facilities. But they didn't call themselves "W-Search Facilities". They called themselves "Google". 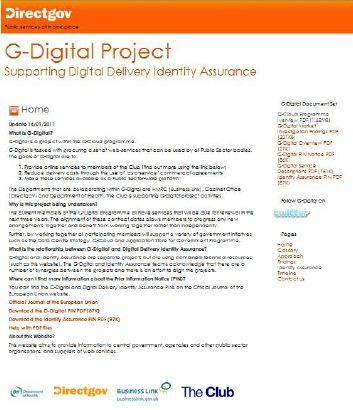 The Cabinet Office have been trying for years to develop a government digital programme. And what did they call it? To start with, the "G-Digital Programme". ... which must have been pointed out to the Digital Engagement team, because some stolid worthy had the bright idea of writing "The Club" at the bottom of the G-Digital Programme webpage. Inviting, you see. Companionable. The sort of group people would want to join. Which deadpan comedian called the digital engagement team the "Digital Engagement" team? Why not "S.W.A.T."? Or the "Whitehall Giants"? Or "Martha's Sappers"? Talking of whom, Martha Lane Fox has provided the G-Digital Programme with a slogan – "digital by default". And with that she has provided them with a problem, because millions of Brits have never used the web. How are they going to access all the public services that become digital by default? How are they going to avoid exclusion by default? It's not a new problem. It arose six years ago when the Cabinet Office came up with Transformational Government -- Enabled by Technology. They didn't solve the problem then and they still haven't. It may be insoluble. Non-web users would need help to access digital public services. Where could that help come from? Libraries? Maybe. Post offices? Maybe not. For the moment, there's no solution in sight. But, next best thing, there is a blog – Assisted Digital. A blog with just two posts on it. "Assisted digital"? How could they? How did anyone think it was a good idea to call the non-existent service to plug the gap between people and the public services they need "assisted digital"? There is only one name possible in the circumstances – "Dignitas". The analogy between delivering books (Amazon) and delivering benefits (DWP) is misleading. It is that analogy that turns us, the public, from being "patients" and "parents" and "travellers" into "customers" in the language of Cabinet Office communications. And it is that analogy that leads us to the notion of a digital Dignitas. It leads to nonsense. The analogy should be abandoned.